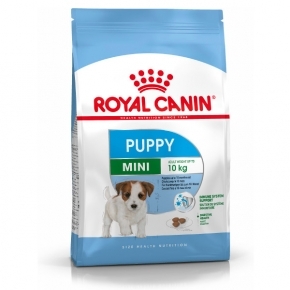 Royal Canin Mini Puppy 2kg dog food. Royal Canin Mini Puppy, for small breed puppies that will ultimately have an adult weight from 1kg to 10kg. For small breed puppies up to the age of 10 months. MINI PUPPY helps support your puppy’s natural defences thanks particularly to a patented complex of antioxidants including vitamin E.